The third of the 2018 GC32 Racing Tour’s five events begins tomorrow on the Bay of Palma. Here, for a third consecutive year, the flying catamaran circuit is competing at the prestigious Copa del Rey MAPFRE. So far this season Franck Cammas’ NORAUTO powered by Team France has been the outstanding performer. They came out on top at both the inaugural GC32 World Championship on Lake Garda in May and at last month’s GC32 Lagos Cup. However the 2016 GC32 Racing Tour and 2011-12 Volvo Ocean Race winner is not having it all his own way. However Erik Maris’ Zoulou finished second in Lagos, scoring five wins and 13 podium finishes out of 20 races. In Palma, the eight GC32s are moored outside the host club, Real Club Nautico de Palma. 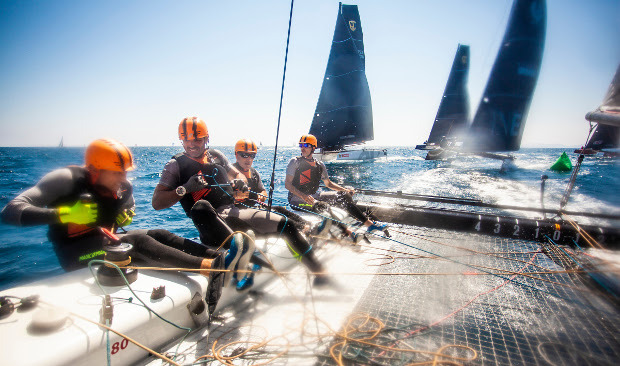 Every day sailors from the top international grand prix boats competing at 37 Copa del Rey MAPFRE get to pass by the twin hulled flying machines, which, with top speeds approaching 40 knots, are by far the fastest boats on the Bay of Palma this week. “I wouldn’t trade my boat for any of the others here,” says Maris proudly. Among the other strong players on the race course this week will be Simon Hull’s Frank Racing, which was a star performer on the last day of the GC32 Lagos Cup. The Kiwi team currently shares the top of the GC32 Racing Tour Owner Driver leaderboard with American Jason Carroll’s Argo. Another threat this week will certainly be INEOS Team UK. The crew from the British America’s Cup challenger is being rotated for this week. New recruits, America’s Cup veteran Joey Newton and former America’s Cup and Volvo Ocean Race sailor Luke Parkinson, are joining Finn Olympic gold medallist Giles Scott and Neil Hunter. On the helm, Leigh McMillan is standing in for Sir Ben Ainslie having sailed as tactician on Simon Delzoppo’s .film Racing last season and won the GC32 Racing Tour in 2015 as skipper of Sultanate of Oman. Also looking to make up ground this week is Realteam, skippered by Jérôme Clerc. The 2017 GC32 Racing Tour winner currently lies second on the 2018 leaderboard, one point ahead of Zoulou. GC32 racing at 37 Copa del Rey MAPFRE gets underway tomorrow 1 August at 1300 CEST and runs until 4 August culminating in a prizegiving, where winner’s trophies will be presented by King Felipe VI of Spain.